This recipe won first place in my town's peach pie contest and oh my! what a pie! Imagine no blanching and no peeling, the secret to unforgettable peach sweetness. This is a blue-ribbon pie, for sure. In 2008, I judged my town’s first-ever peach pie contest. What a kick! The organizers expected local grandmas to appear bearing pies oozing peach juice, filling the air with the scents of cinnamon and nutmeg and hmm, would anyone choose a pinch of ginger? Instead, there were seven entries, including yes, a nice grandma or two. But then the young pie bakers arrived. A mother-daughter team was inspired by the movie Waitress, right down to the heart-shaped pastry in the center. A pair of giggly twenty-somethings entered on a lark, looked up recipes online and made not one but two very creditable pies; they laughed that their mothers don’t make pie – but now, thanks to the contest, they had! My fellow judges and I nibbled at pastry and swooned over sweet peaches. Second prize went to a girl only 15 years old. But first prize was no contest, all of us were seduced by one pie with an over-the-top, picked-prime peach flavor. Pie baker Chris Berg’s trick for capturing peach flavor? Cook the peaches with their skins on! Imagine, a recipe that is simpler (no blanching and no peeling) and better (oh-so-peachy). SAVE the SCRAPS Don’t waste the leftover pastry scraps! But don’t re-roll the pieces either. Just arrange all the odd-shaped scraps on a baking sheet. Sprinkle with a little sugar and cinnamon, bake until golden and crispy. I usually stick the scraps in with the pie, setting the timer for about 10 minutes, then checking every minute or two until done. ALANNA’s TIPS For consistency, Kitchen Parade recipes slice pies into eight pieces. But this pie is so rich and good, no one will feel cheated if it’s sliced to serve 10 or 12. I use 6 cups of peaches for a shallow pie pan, 8 for a deep-dish pie. I’ve adapted the filling recipe, cooking the syrup alone for a bit, adding the peaches at the last. This creates a thick syrup without overcooking the peaches. Should a lattice top be woven? Sure, if you insist. But to my aesthetic, weaving the lattice is more fuss and fret than fetching. CRUST Mix the pastry dough, let chill for at least 30 minutes. Roll out the bottom crust and arrange in a pie plate. Trim the pastry, leaving an inch hanging over the side. Refrigerate. ASSEMBLE Preheat oven to 425F. Roll the top crust, cut into nine long narrow strips. Working quickly, pour the filling into the bottom crust and arrange the pastry strips in a lattice, five strips running left to right, four strips running up and down (see TIPS). Turn the overhang over to form the crust’s edge, pinch to seal. BAKE Bake at 425F for 10 minutes. Reduce temperature to 350F, bake for another 25-35 minutes or until the crust is golden on top and bottom and the filling is bubbly. COOL & SERVE Let cool for 2 hours or more. Slice, serve and savor. For extra decadence, top the slices with scoops of vanilla ice cream. Kitchen Parade is written by second-generation food columnist Alanna Kellogg and features fresh, seasonal dishes for every-day healthful eating and occasional indulgences. Do you have a favorite summer pie recipe that other Kitchen Parade readers might like? Just send me a quick e-mail via recipes@kitchen-parade.com. How to print a Kitchen Parade recipe. If you like Kitchen Parade, you're sure to like my food blog about vegetable recipes, too, A Veggie Venture. Follow Kitchen Parade on Facebook! Left - Chris Berg and her prize-winning peach pie. Top Center - A pastry heart in the center of the peach pie, inspired by the movie Waitress. Center - Pie bakers Morgan and Rian, helping Morgan's mom Ashley Herrick bake a peach pie filled with love, recipe here. Right - Peaches from Missouri and Illinois are 'the best'! That is one beautiful peach pie! I have never made peach pie... only peach cobbler. I think that is going to change! Question....The skins are still on in the completed, cooled pie? How does that fuzzy texture do in the finished pie? I am completely at a loss to think how this will work. Cait ~ Good question, I should have mentioned it. The skins just 'melt' into the peaches, you don't even know they're there. THAT's how it will work! I'm bookmarking this recipe ASAP. Thanks for sharing it with us. Congratulations on winning! OK, now I am counting the days even more! until the local peaches come into season here! Alanna, do you suppose the filling would freeze well, too? I mean, how awesome would it be to bake a "fresh" peach pie, say, for Thanksgiving? Sounds divine. What a great idea to keep the skin on! Yum, Alanna - this sounds so good, and is making me hungry even after a big dinner. Thanks for posting this! Aren't you the lucky duck---getting to judge a peach pie contest! I would have loved to have been there with you. The last peach pie I made was a Bourbon-Peach Pie (southern recipe) and while it was good, it wasn't great. 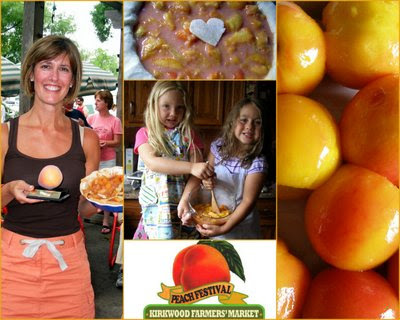 This one will be next on the list and you are so right---peaches from Missouri & southern Illinois are the BEST!! I made the pie and it tasted great! Only problem I had was that the peach filling turned more of a brown instead of the pretty rose color on your picture. Do you know what I could do to prevent that? Annie ~ Hmm, the only thing I can think of is that the peaches themselves, especially the skins, affect the color. I've just made the pie twice, both times the color was beautiful. If it happens to you again, I might try adding a little lemon juice so the peaches don't oxidize and turn dark. Glad it tasted good but our "eyes like to eat" too. Thanks, Alanna. After I asked you the question, I thought maybe fruitfresh, but lemon juice might be just as good. These were fresh peaches from a local fruit stand, but they were a little on the unripe side, so maybe that affected the color once the filling was cooked. The next time I make this recipe, I WON'T add the NUTMEG, since we weren't a big fan of the nutmeg. Also, keep all the piecrust ingredients in the freezer until ready to use. Easier to work with. Delicious!